New listingHugo Boss Green Label V Neck Jumper in size Large with pit to pit of 24"
HUGO BOSS Green Label V Neck Jumper in size Large with pit to pit of 24", jumper is in a superb blue and is in excellent condition. Regular fit. on super soft 100% virgin wool. 100% authentic. An adaptable wardrobe staple in soft virgin wool by BOSS Menswear. 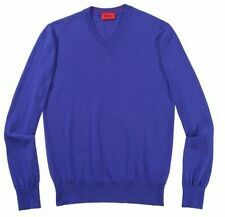 With ribbed cuffs and a V neckline, this refined sweater is detailed with a subtle embroidered logo at the chest. Combinable with your favourite jeans, shirts, shorts and chinos, this is a truly versatile design. 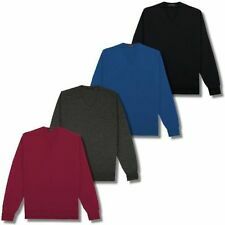 BOSS Hugo Boss Men's Extrafine Merino Jumper / Sweater L ,Ex.cond. LENGTH FROM SHOULDER TO HEM 27". 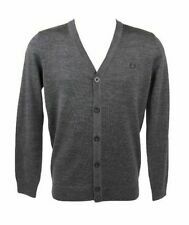 Top quality cardigan from HUGO BOSS just exuding luxury in a "less is more" kind of way and let the quality speak for itself. The iconic signature BOSS "Black" label logo to the side seam. Outside Shoulder to cuff 26". 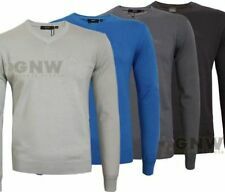 mens jumpers xl wool by HUGO BOSS “Baram-L” NEW SEASON-BARGAIN PRICE-QUICK SALE! Wear it to add a layer of warmth to a smart-casual ensemble. 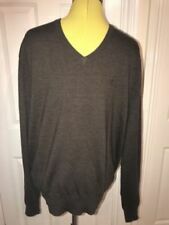 Hugo Boss Mens Extra Fine Merino Wool V Neck Grey Sweater. Condition is New with Tags. Slim fit. Hugo Boss Full Sleeve V-Neck Golf Sweater. Size S Elegant design. Boss with Hugo Boss embossed at front and right arm at the back. Bought from Bentalls Kingston for £179 Grab a bargain. Plus spare. A super soft fine knit cardigan in an elegant petrol blue with the iconic signature BOSS "Black" label tab to the side seam. The weave changes to rib around the cuffs and hem to give an "elasticated" feel for added comfort and syle. Top quality cardigan from HUGO BOSS "Black" label slim fit just exuding luxury in a "less is more" kind of way and let the quality speak for itself. plus spare. A super soft fine knit cardigan in an elegant charcoal grey with the iconic signature BOSS "Black" label tab to the side seam. 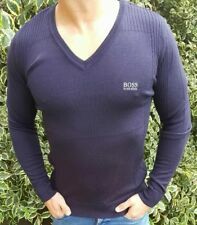 Hugo Boss wool v neck jumper. Size XL, armpit to armpit 24". Regular Fit. Total Length: 50 cm = 19.7 in. Armpit to armpit. Hugo Boss Green Label V Neck Jumper in size Large with pit to pit of 24"